Choosing to donate a car in NY through organizations like Miles Ahead Network opens the opportunity to a lot of advantages, ranging from a sense of moral fulfillment to tangible financial benefits. No matter what your reason may be, you would probably agree that getting tax donations would have to be one of its greatest perks. 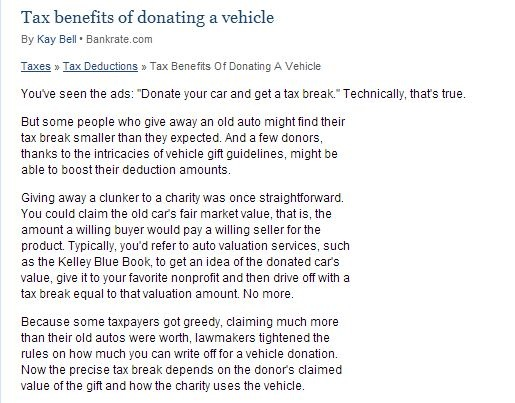 To get a tax break for your donation, you should first figure out how much your car is currently valued in the market (so as to determine how much you can get) – but this isn’t always a straightforward deal. For one, you would have to refer to reputable auto valuation services for this – in other words, you can already expect that similar vehicles won’t always have the same value. Since many people opt to cheat by declaring their car’s worth to be much more than it really is, the IRS has imposed more stringent policies. Now, you can only claim deductions within the threshold of $500, whether it be automobile, boat, plane or other sorts of vehicle donation. To exceed that amount means to undergo more complex guidelines. What then, if you are claiming less than $500 for your donated car? If the amount is less than the aforementioned, but not lower than $250, you should get a written documentation from the non-profit you donated to, containing the date of donation, the details of your vehicle and a statement saying that no compensation was given for your offer. Companies like Miles Ahead Network can help you efficiently donate your car in NY. Make sure that you can claim your tax deductions properly afterwards.